Incheon is South Korea’s third largest city, bordering the capital, Seoul, which is directly to the east. Situated on the northwest coast, it also has numerous offshore islets connected by causeways and bridges. A longstanding transportation hub, Incheon is both historically rich and culturally significant; most notably, it saw the Battle of Inchon during the Korean War in 1950 which proved a decisive victory for the United Nations. Today, Incheon is a metropolitan city with a population of 2.8 million and has led the economic expansion of South Korea thanks to the development of its enormous, international port. Moreover, the recently completed New Songdo City plan was the most expensive real estate project in the country, creating an international business city within Incheon itself. Famed for the country’s singular official Chinatown, Incheon is the best place in South Korea for authentic Chinese cuisine. Known for its 11-metre-high gateway, the population of the modern day Incheon Chinatown is made up of mostly 2nd or 3rd generation early Chinese settlers who came here after the signing of the China-Korea Treaty of 1882. 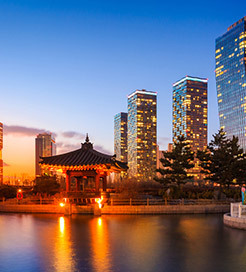 Close by is Liberty Park, with its iconic General MacAurthur statue and memorial of the Centennial Anniversary of relations between the US and South Korea, and for shopping, Bupyeong is a must. Containing the largest underground shopping mall in Korea, it features hundreds of small vendors selling everything from makeup and clothes to innovative electronics. Other popular destinations include Yeongjong and Muui-dong off the west coast, with their immaculate sandy beaches and small villages. These islets are frequented by casual tourists and day trippers seeking to explore the rolling hills and relax on sandy shorelines. Muui-do is blanketed in vineyards, with a craggier coastline offering fascinating sea life which includes hermit crabs, egrets and shellfish. Yeongjong is an exclave of Incheon’s Jung-gu district and is easily accessible via two bridges, while the island itself is considered part of the Incheon Free Economic Zone. International crossings from the Chinese city of Lianyungang traverse the Yellow Sea twice a week, arriving at Incheon in approximately 26.5 hours. Although a long haul journey, this route represents a convenient choice of transport given the high quality of ships boasting a broad selection of cabins, taking you directly to one of Asia’s most iconic ports. For more information, please visit our Ferries from Lianyungang City to Incheon page. For more information, please visit our Ferries from China to Incheon page.